Africa To Pay Europeans For Green Policies? afrol News – In efforts to make quick and symbolic gains in Europe’s otherwise failed policies to curb climate gas emissions, environmental and anti-globalisation politicians are aiming at Africa’s few economic success stories. Campaigns to buy locally produced food and travel to local destinations particularly hit out against African products. Consumers in Europe are again growing more environmentally conscious and are willing to use their purchasing power to assist in what is widely seen as our era’s most pressing problems – the overspending of energy and global warming. Meanwhile, European politicians have been those pressuring strongest to gain support for the Kyoto Protocol while having totally failed to lower emissions of climate gases in their own countries. In every country, emissions have steadily increased.Populist solutions that are to satisfy costumers, politicians and the European industry alike are therefore surfacing all over Africa’s neighbour continent and the main market of its products. And the solutions seem neat and nice – easy to understand and with the potential of creating more work locally. Even the industry starts propagating these solutions. The victim mainly is Africa, because the message is that, as longer as a product or person is transported, the more energy is wasted unnecessarily. Worst of all is airborne transport, having the highest emissions of climate gases such as CO2. Unluckily, Africa is far away from European markets and poor transcontinental infrastructure puts most products and travellers on an airplane. All over Europe, therefore, home-grown campaigns are being promoted, attacking Africa’s newest and most successful export products. Anti-globalisation activists, “green” politicians, local industry and even occasional experts and scientists head these “buy local” campaigns. One of the latest campaigns is being launched in Germany, Europe’s most populous state and biggest single market. The campaign goes “Sylt instead of Seychelles”, referring to a fragile German North Sea island with an overstretched and environmentally damaging tourism industry. Tourism and climate expert Dr Manfred Stock developed the slogan and told the daily newspaper ‘Berliner Zeitung’ that consumers worrying about global warming should avoid intercontinental flights and rather take the train to a German or European destination. The much-quoted researcher is in line with policies promoted by Germany’s Federal Environment Agency (UBA). UBA President Dr Andreas Troge has made the climate change issue his agency’s foremost focus, and one of the ways consumers could “do something on your own” is by changing their travel behaviour, UBA says. A single traveller flying to an intercontinental destination produces more than five tonnes of CO2, he told the German press, while someone travelling by train within Germany only had the emission of ten of kilograms of CO2 to account for. Some even go further and have started penalising air travellers. In Norway, flyers have started paying for their CO2 emissions. So far, only domestic flights are penalised to make sure Norwegian airliners are not losing out in competition with other companies on international flights. But Norway is among many countries working for a CO2 tax on world-wide flights, which of course in particular would make long distance flights much more expensive. This comes as most African states are investing massively in their nascent tourism industry and as Africa is surfacing as a modern and exciting travel destination in most Western markets. Some sub-Saharan states, in particular Seychelles, Mauritius, Cape Verde and The Gambia, already see tourism as their greatest foreign exchange earners. In Kenya, Tanzania, Senegal, Namibia, Botswana and South Africa, the travel industry by now is a vibrant success, while newcomers as Mozambique, Ethiopia, Gabon and Burkina Faso pin great investments and development hopes to the industry. d local community development based on the new tourism revenues. In Gabon and Madagascar, vast landscapes have bee protected to be able to promote eco-tourism. No measure in African history has proven so successful in stopping tree cutting and forest conservation than prospects of tourism revenues.Mature markets like Seychelles, Mauritius and South Africa are already world leaders when it comes to conservation and management, knowing that their tourism industry depends on a sound nature. 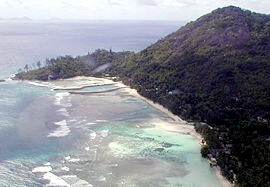 At the same time, African destinations like Seychelles are demonised as anti-environmental by European “experts”. If successful, these campaigns could have a severe effect on the European market, which for the first time is experiencing a positive image of Africa as a must-see travel destination. But also other African success stories are threatened by this new “stay local” trend. During the last decade, African agricultural products are increasingly admitted into the protectionist European market, even when also produced in Europe. 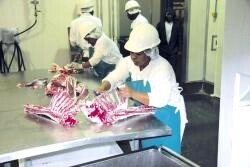 This includes beef from Namibia and Botswana, fresh flowers, fruit and vegetables from Kenya and even processed food products from South Africa and Ghana. None of the few African countries that have managed to enter European markets with agricultural products that compete with local producers have had an easy path reaching their position. Food quality and hygiene standards in Europe are extremely rigid and to a large degree designed to exclude foreign competition. To be able to reach sceptical European consumers, African producers mostly also have been obliged to follow strict environmental and social guidelines. Also, African food products for years had to fight against false prototypes promoted by seemingly well-meaning anti-globalisation activists that to a great degree were funded by local farmer organisations. Development specialists – who do not get much air-time in European media – had to explain on and on again that European consumers were not “stealing food from starving Africans” when buying their products, but that these imports indeed would promote wealth and empowerment in rural Africa. Already in 2003, airlifted baby carrots and garden peas from South Africa were highlighted in energy budgets of imported foods. For carrots, “it will have taken 68 calories of energy in the form of fuel to air freight each calorie of carrot energy,” while “fresh peas require approximately two and half times the energy to produce, package and distribute as those sourced locally,” the British daily ‘Guardian’ reported. South African wine, which is mostly shipped, however was praised for its “tiny” CO2 emissions. Of all the African products scrutinised, only wine is not produced Britain. Years of campaigning against African agricultural products in the UK – whose funding has yet to be revealed – has already left its mark on British consumers. The easy-selling “fact” that locally produced vegetables, meat, flowers and fruits are more environmentally fit than African imports has made many consumers look for “low emission products”. consumers see for themselves how far their food basket had travelled and how much CO2 emissions had been needed.Tesco is one of the main channels for Kenyan products to European consumers – indeed half of Kenya’s agricultural exports go to Britain. Naturally, the surprise marketing stunt caused frustrations at the Fresh Produce Exporters Association of Kenya (FPEAK), which had not been consulted on the move. While Tesco promised to keep on importing Kenyan products, “carbon counting” labels on these goods from 2008 will tell a one-sided story to British consumers. From Britain, this trend is spreading to all over Western Europe. In Sweden, the leading daily ‘Aftonbladet’ attacked local supermarkets for not following Tesco’s example “despite the fact that one fourth of climate gases emitted by Swedes originate from our food.” Ecologist Annika Carlsson-Kanyama enthusiastically helped the Swedish daily to make a parallel guide for consumers, where “airborne tropical fruits” were labelled as no-goes for conscious consumers. 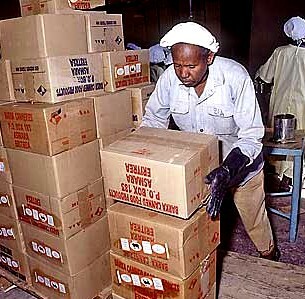 In other countries, old arguments against food imports from Africa are resurfacing. In the programme of Nature and Youth, one of the environment groups gaining most media attention in Norway, new and old “facts” are mixed: “Locally produced food is more environmental, safe and solidary,” it says, claiming solidarity with African producers “for not spending the resources of others.” Norway is a main importer of Namibian beef. While the great focus on “environmentally damaging” food imports from Africa and flights to Africa is even increasing, less and less attention is given to the positive environmental balance of this trade. Forgotten is the fact that almost 100 percent of input factors in African agriculture are locally made and almost no machinery is used in production, while European farmers import fertilisers, pesticides, seeds, seasonal workers and oil-consuming machineries from all over the world. Forgotten is also the fact that food exports and tourist destination developments empower Africans to protect and manage their environment and even reduce African-induced CO2 emissions. Eco-tourism has greatly promoted the protection of forests, mangroves, savannas and coral reefs in Africa – which also are key environs when it comes to storing CO2. A larger and more diversified food production in Africa also reduces the dependence on imports to supply African consumers. And the greatest irony of all is that, while imports from Africa again are demonised, exports from Europe to Africa causing the same CO2 emissions are promoted as ever before. Subsidies are paid to promote the consumption of Spanish biscuits, French dairy products, European wheat instead of local staple foods, European tropical fruit juices, trawler caught fish dishes and, of course, all kind of industrial products. Even Tesco, being concerned about CO2 emissions of transported foods, shows its real face when it comes to exporting from Europe. Only two weeks before its much-publicised marketing campaign on “carbon counting” labels, the UK retailer issued a less-publicised statement. It announced the opening of ten supermarkets in China, where it will be selling popular European grocery products. Political support in Beijing was bought by promising to buy Chinese products worth euro 3.3 billion annually for exports. In China, Tesco meets competition from the giant chains Carrefour of France and Metro of Germany, already assuring a European export of products and lifestyle to the world’s fastest growing market. Who would come up with a silly idea of starting to count CO2 emissions when Europe’s super retailers are taking up competition with America’s Wal-Mart, thus promoting French, German and British products among China’s 1.3 billion inhabitants? The Zambian Enterprise is proving to be the best destination for FDI (Foreign Direct Investment) in south-central Africa. From 2001 todate, foreign direct investment has more than quadrupled in some instances ranging from economic activities such as mining, tourism, manufacturing and financial services. The biggest recipients are tourism and mining and there is need to increase the manufacturing base of the enterprise as soon as possible. This is because such endeavors tend to increase skill for the nationals in highly technical fields, which are the basis for prosperity and economic sustainability. Thus far, thus good and the Zambian Enterprise is on the right path to economic recovery with the ability to continue attracting more FDI unsurpassed by any rival in the region but there still remain serious worries as to why real GDP is under 6% annualized … thanks a trillion. US First Lady accompanied by her daughter Jenna and the Zambian First Lady graced students at the Regiment Basic Primary School in the middle of Lusaka which is home to some 1,200 students. These students attend school in three shifts beginning at 6:45am with the final classes finishing at 5:00pm. Their ages range from 7 to 18 years old … as an educator herself, education is very close to Mrs. Bush’s heart. Powered by play, the PlayPump water system is a children’s merry-go-round attached to a water pump and storage tank. While children have fun spinning on the PlayPump merry-go-round (1), clean water is pumped (2) from underground (3) into a 2,500-liter tank (4), standing seven meters above the ground. A simple tap (5) makes it easy for adults and children to draw water. Excess water is diverted from the storage tank back down into the borehole (6). The water storage tank (7) provides a rare opportunity to advertise in outlaying communities. All four sides of the tank are leased as billboards, with two sides for consumer advertising and the other two sides for health and educational messages. The revenue generated by this unique model pays for pump maintenance. The design of the PlayPump water system makes it highly effective, easy to operate and very economical, keeping costs and maintenance to an absolute minimum. Capable of producing up to 1,400 liters of water per hour at 16 rpm from a depth of 40 meters, it is effective up to a depth of 100 meters. A typical hand pump installation cannot compete with the PlayPump system’s delivery rate, even with substantial effort. In addition to providing safe drinking water, the innovative pump uses advertising billboards located on the storage tank to deliver powerful educational messages to children and families … thanks a trillion. US First Lady Laura Bush is coming to Zambia … she is probably the first lady for a sitting president to visit Zambia and this is great news for the Zambian Enterprise. The reason it is great news is because every time such a high profile figure close to the American presidency visits a nation for whatever reasons, the world tends to look, see and or want to take notice. This is great development and we at the Zambian Chronicle want to wish the First Lady a beautiful stay and hope she gets to enjoy all that our enterprise has to offer, welcome aboard Madame First Lady and we wish you God’s speed … thanks a trillion. BBC News has been to Zambia as part of a special series looking at how Africa is faring one year on after the promises of increased aid made at the G8 summit in Gleneagles. 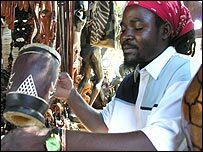 Jon Cronin reports on the challenges facing Zambia’s tourism industry.Bright Sabata’s market stall is crammed full of traditional African crafts and trinkets.Hemmed in by a dozen other traders, his ceremonial masks and animal-skin drums are displayed alongside cow-bone necklaces and wooden figurines. It is a sight many visitors would expect to see in Livingstone, Zambia’s gateway to the mighty Zambezi river and Victoria Falls. “Tourism is important for me, it is where I get my living,” says Mr Sabata, who carves many of the objects he sells to support himself and his family. But despite the breathtaking location, Mr Sabata and his fellow traders are not as busy as they would like to be. 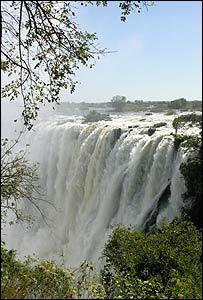 Zambia’s growing tourism industry is dominated by the Victoria Falls, known locally as Mosi-oa-Tunya. The low rumble of the 100m falls can be heard for miles around, as millions of tonnes of water from the Zambezi fall into a narrow chasm every minute. Mr Sabata, who hails from the nearby Mukuni village in whose tribal land the falls are situated, has been working from his stall for more than two years. But as Zambia’s tourism industry has been developing, Mr Sabata says the fortunes of the Mukuni people have been sliding at the expense of some of the major developers. Mr Sabata’s pessimism is not shared by all. Official figures suggest that the tourism industry now employs more than 20,000 people in Zambia. The government has ambitious plans to bring in a million tourists annually by 2010 – a move which could generate more than $520m in revenue alone. Zambia also hopes to see the number of people employed in the sector more than double in four years time, a significant potential boost for one of the world’s poorest countries. A short walk from the dusty market where Mr Sabata keeps his stall is the plush, five-star Livingstone Sun hotel. Based along the banks of the Zambezi, the South African-run hotel is among Zambia’s most luxurious, where high-paying guests can encounter wild zebra, monkeys and giraffe in its extensive grounds. Zambia’s expansion in the tourism industry has come as many holidaymakers have been deserting its politically unstable southern neighbour, Zimbabwe. Both countries share a border along the Zambezi, and Zimbabwe was for some time the country where most tourists would base themselves in order to see the Victoria Falls. 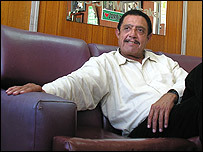 But Mr Storkey rejects suggestions that Zambia’s gains have come largely at Zimbabwe’s expense. “It’s actually very sad,” he says. “If it was a case that tourists just migrated across from Zimbabwe to Zambia, we would be running at huge occupancies, which is not the case at all. However, he adds the situation in Zimbabwe “has given us the chance to establish Zambia as a destination”. Unsurprisingly, Zambia’s tourism board chief is equally keen to promote Zambia as a choice destination. “In Africa, there are really only two places for you to see – the pyramids in Egypt and the Victoria Falls in Zambia,” says Errol Hickey, chairman of the Zambia National Tourist board. Although his words are calculated to raise eyebrows among his counterparts in other African countries, Mr Hickey admits that tourism in Zambia faces its own challenges too. “The main problem that we have is that Zambia is a fairly expensive destination,” he says, referring to the recent soaring value of Zambia’s currency, the Kwacha. In addition, Zambia currently has no international airline of its own after a previous government decided it could no longer afford to run it – a decision Mr Hickey describes as an “awesome blow”. But despite the setbacks, Mr Hickey believes Zambia can continue to develop its tourism industry – encouraging more companies to open new hotels and attract an increasing number of people to some of the most beautiful natural scenery in Africa. “People have a choice about where they want to go, and that’s what the tourism challenge is all about,” he says. It is unbelievable what one gets when they get into the psyche of former President Chiluba and his new witching hunting schemes on Dr. Kenneth Kaunda our first republican president. All this new talk about how that President Kaunda stole this and that while he was in office is to say the least bordering on mere childishness. President Mwanawasa also called on a foreign entity, in this case a London Court in a civil liability suit for FTJ Vs. 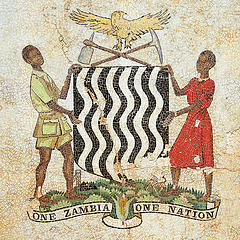 The People of the Republic of Zambia. In the later, the accused was found guilty and ordered to restitute. What is more ironic however, is the way KK took the case with a grain of salt and even after being proven innocent showed great non-minacity as a statesman. 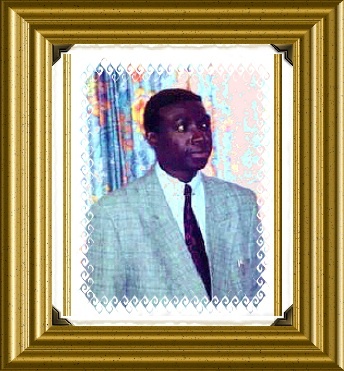 For all intents and purposes Dr. Kaunda has engaged in serious work for fellow men and women and has a lot of work to do. Unlike others who would only operate on selective expedience, Dr. Kaunda needs to be left alone. After all even Scotland Yard found no wrong doing in comparison to Dr. Chiluba.